Brexit could hit the bottom line of a huge new cross-Irish border dairy business, its boss has said. Michael Hanley is the chief executive of Lakeland Dairies. It has just merged with another big player in the Northern Ireland milk market - LacPatrick - to create a new venture. Mr Hanley said Brexit would mean extra costs, build inefficiency into the business and could reduce profits. "The model we are going to move into will not be as efficient and will not return as much per litre of milk as the model that is currently there," he said. The company exports 240 different products to about 80 countries. The dairy industry is one of the sectors of agri-food with the greatest exposure to the consequences of leaving the EU. 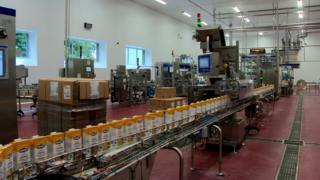 About a third of Northern Ireland's milk crosses the border into the Republic of Ireland for processing. Mr Hanley said someone would have to pay the extra costs associated with any customs checks and border delays. "There's going to be administration, extra costs, red tape, customs documents," he said. "Inefficiencies that we have moved away from for the last 15-20 years and suddenly they're going to come back. "Somebody is going to have to pay for that." With the merger, Lakeland has about 3,000 farmers on its books across 15 cross-border counties. It boasts an annual milk pool of 1.8bn litres, about two thirds of it in Northern Ireland. He said farmers have asked more questions in the past four weeks than in the two years since the Brexit referendum. The company has processing capacity on both sides of the border, including plants in Artigarvan, Ballyrashane, and Banbridge and Newtownards, and could deal with all of its northern milk in Northern Ireland. But the issue is whether all of what is produced could then find its way to market. As an example, milk powders produced at a £30m dryer in Artigarvan, County Tyrone, have traditionally been sent to west African countries under existing EU trade deals. At the moment those trade deals have not yet been rolled over and are not yet available after Brexit. In a wide-ranging interview, Mr Hanley said Lakeland supported Theresa May's EU withdrawal agreement and the transition period it envisaged would give firms like his time to adapt to the new trading environment. He said with a presence both north and south the company was "very well hedged" in relation to Brexit, whatever the outcome. He said that in time the company could "mix and match" its products on either side of the border to supply its customers. But he called for clarity on the future trading rules and said the past two years had been a "frustrating" experience. Asked about the mood in dairy on both sides of the border, Mr Hanley said the industry in the Republic of Ireland was "cautiously optimistic" but in Northern Ireland there appeared to be a "realisation that things won't be as good as they were".